Joan Baez has announced a run of 10 dates at l’Olympia in Paris next June. The dates are the first to be announced for Baez’s Fare Thee Well 2018 tour with more to be revealed soon. The l’Olympia tickets are available from today on a presale and next Monday, July 3rd to the general public. 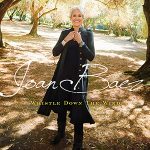 UPDATE: Joan Baez’s new album, Whistle Down The Wind, is out now – find out more here.